It’s the year of the Rabbit. These restaurants are celebrating. Ben Pao As opposed to the pan-Asian Big Bowl, the theme at this LEYE spot is regional Chinese. Purists may still stick up their noses, but if they do, it’s likely because they haven’t tasted this spot’s renditions of Mongolian, Cantonese, Shanghai and Szechuan dishes, such as crispy cubes of sesame-coated tofu or salty-sweet pork with scallion pancakes. Through February 13, the restaurant offers special Year of the Rabbit dishes such as xiao long bao (soup dumplings), “long life” noodles with char siu pork and a hot and sour whole fish. 52 W Illinois St (312-222-1888). El: Red to Grand. Bus: 22, 36, 65. Lunch (Mon–Fri), dinner. Average main course: $22. Chen’s Surrounded by all the boisterous Clark Street Cubs bars pushing pub grub, this upscale Chinese restaurant and sushi bar, which specializes in crispy duck, whole red snapper and a variety of stir-fry dishes–stands out like a sore thumb. It’ll stand out even more on Saturday 5 at 9pm, when traditional lion dancers will conduct a New Year’s performance. 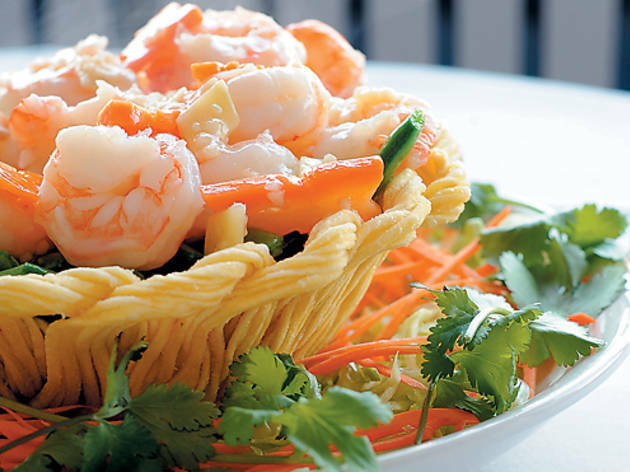 Supplementing the celebration is a special “Good Luck” menu (available through February 13) featuring lychee chicken, beef with bamboo shoots and seafood pan-fried noodles. 3506 N Clark St (773-549-9100). El: Red to Addison. Bus: 8, 22, 152. Dinner. Average main course: $11. MingHin Cuisine According to this well-received newcomer (see Listings), it doesn’t matter what you actually cook for the new year—it only matters what you call it. To that end, the Chinese New Year menu here—available through February 17 and featuring oysters with seaweed and lots of chicken dishes—will be made up of dishes whose names evoke good luck and prosperity. 2168 S Archer Ave (312-808-1999). El: Red to Cermak/Chinatown. Bus: 21, 24, 62. Breakfast, lunch, dinner. Average main course: $11. Phoenix Restaurant This dim-sum stalwart is known for its bao, crêpes and other daytime small bites. 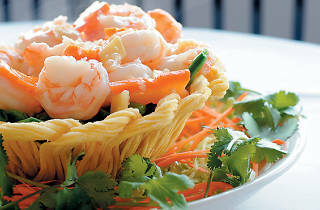 But come Chinese New Year, you may be tempted to order from a special menu of New Year dishes. Or you may just want to go all out and come here for the Chicago Chinatown Chamber of Commerce’s official New Year’s dinner (Wednesday 9, 6–9pm), which will feature a cocktail reception and a silent and live auction. For tickets ($75), visit chicagochinatown.org. 2131 S Archer Ave, suite 2 (312-328-0848). El: Red to Cermak/Chinatown. Bus: 18, 21, 24, 62. Breakfast, lunch, dinner (dim-sum menu served until 3pm). Average main course: $12. Red Light Ryan Fowler, the executive chef who took over for Jackie Shen earlier this year, is showing what he’s made of with his Year of the Rabbit menu, available for dinner on Thursday 3. Whole roasted rabbit will be available, as will pulled rabbit siu mai with spicy mango chile sauce and crunchy slaw. Fowler takes the rabbit theme all the way to dessert, where he offers—what else?—carrot cake. 820 W Randolph St (312-733-8880). El: Green, Pink to Clinton. Bus: 8, 20. Lunch (Mon–Fri), dinner. Average main course: $20. Shanghai Terrace Normally we don’t condone paying through the nose for Chinese food when Chinatown options abound, but this gorgeous fourth-floor terrace, brimming with fresh flowers and offering a view of the historic Water Tower, is hard to beat. Especially during Chinese New Year, when chef Ivan Yuen will offer a six-course dinner ($98, available through Saturday 5). Dishes on the menu include roasted pigeon and noodles with lobster. The Peninsula Chicago, 108 E Superior St (312-573-6744). El: Red to Chicago. Bus: 3, 10, 26, 29, 66, 143, 144, 145, 146, 147, 148, 151, 157. Lunch, dinner (closed Sun). Average main course: $20.